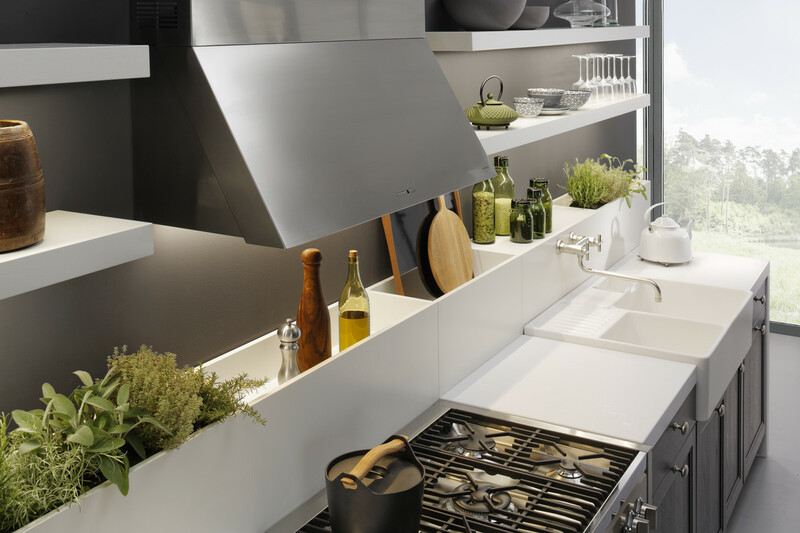 Bora has developed an attractive cooktop that eliminates the need to have a separate extractor hood above the hob, saving space and giving the go ahead to more daring Kitchen design options, such as having the cooktop fitted on an island placed immediately underneath a skylight or roof light. The high-performance ventilation technology, applied through a ducting or an air-circulation system (it is optional), allows for the sucking of the cooking vapours and odours to happen precisely when they arise, that is, from the cook-pot. There are currently 4 models of Bora hobs available: the Bora Professional 2.0, the Bora Professional, Bora Classic and Bora Basic. 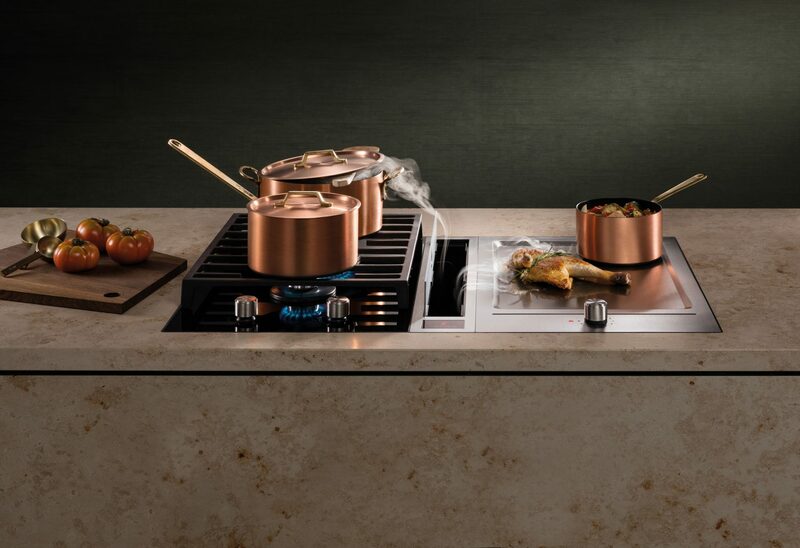 To know more about the Bora hobs, please see our Bora Blog entries, Bora: clever cooktop extractors that work and Bora extractor hobs – Bora Basic vs Bora Classic, or visit one of our Showrooms, in Kingston or Richmond. Concrete front cabinets have a unique, bold and urban quality. They’re a wow-factor in themselves. Many manufactures produce concrete effect fronts, but our favourite is Leicht. To achieve the Leicht Concrete effect, the Kitchen front cabinets are smeared with a fine concrete layer in a highly skilled process to achieve the characteristic concrete surface. An added protective lacquer coating gives it the final touch. Leicht Concrete fronts come in four colours, Dakar, Manhattan, Brasilia and Le Havre. The use of different materials makes a Kitchen more exciting and interesting. 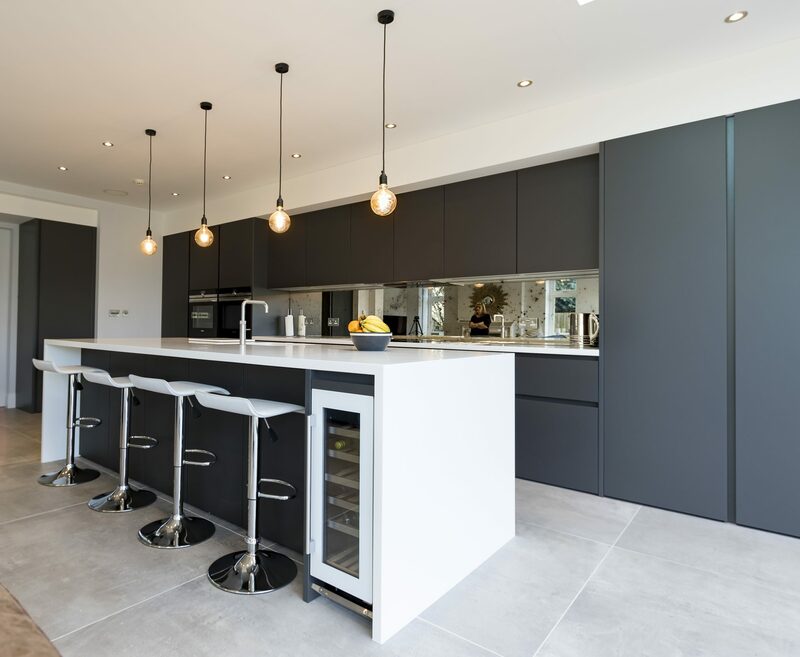 Combine concrete front units with colour-coordinate units, elegant stainless appliances, an ultra-modern worktop and a natural solid wood on a breakfast bar for a dazzling result! Light tones, paired up with the textured concrete effect units like the RIVA Concrete grey reproduction from Nobilia, also works beautifully. 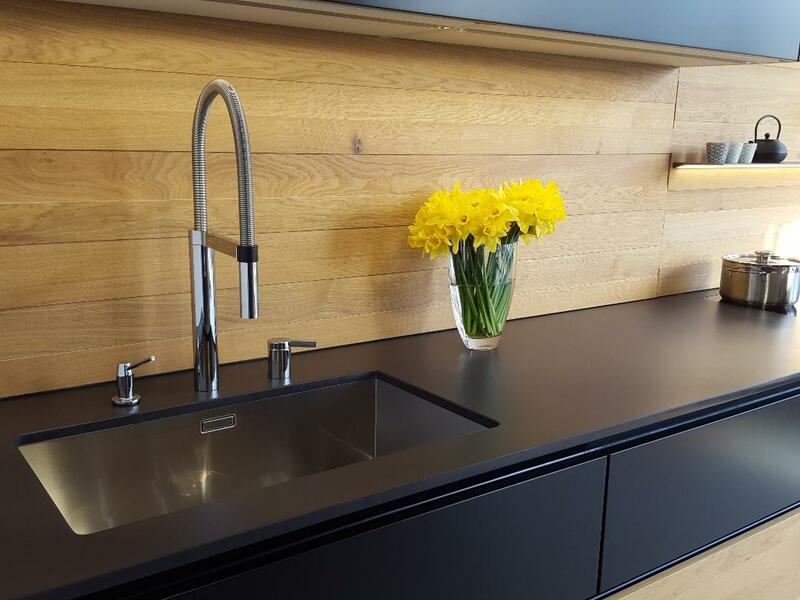 The most up-to-date materials we have seen in terms of Kitchen worktops are Dekton and Neolith. Dekton is ultra-compact surface by Cosentino that offers extreme performance and unique designs. It is a sophisticated blend of raw materials, glass, porcelain and pigment. It can handle extreme pressure, exposure and high-temperatures. Because it can be manufactured, it offers almost unlimited possibilities in term of designs and is very flexible in terms of size (320cm x 144cm) and thickness (between 8 and 30mm). One of the most popular design option is the marble effect Dekton Aura. 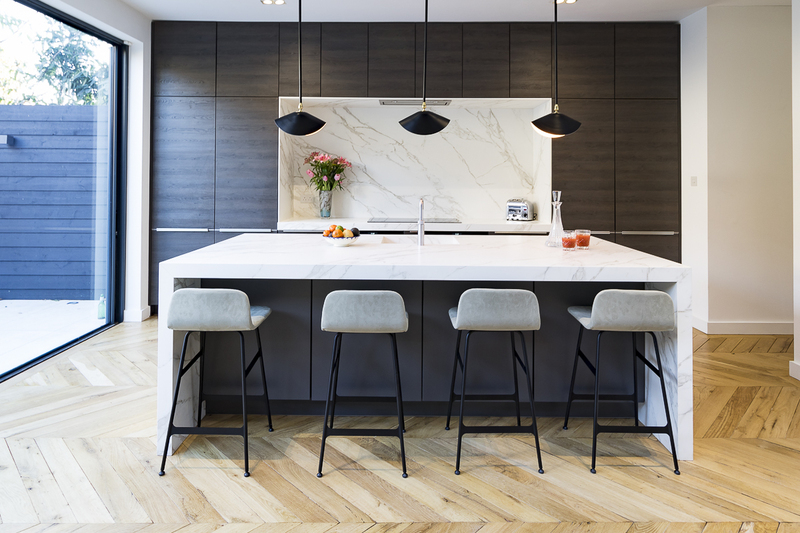 The veining colour that is presented as a marble imitation has unique properties, such as the reproduced matching compositions, where continuous veins appear carrying on from one slab to the next or from the worktop to the splash back, giving it an outstanding visual effect. 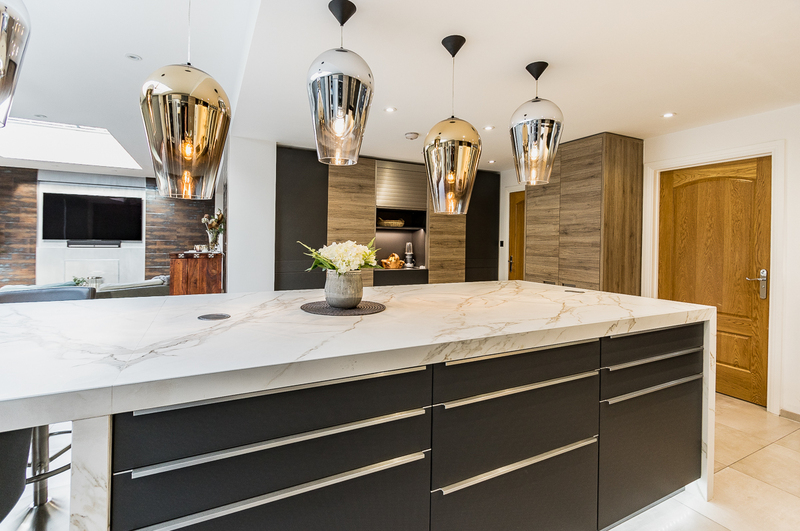 Another cutting-edge material we have seen in terms of Kitchen worktops is Neolith. There is a wide range of finishes to suit most taste requirements and is also a very practical option. The Neolith manufacturing process uses natural materials, extreme heat and intense pressure to produce one of the most durable surface material available today.  The range includes finishes in silk, satin, river washed and polished. Neolith comes in natural form in 12 millimetres thickness. 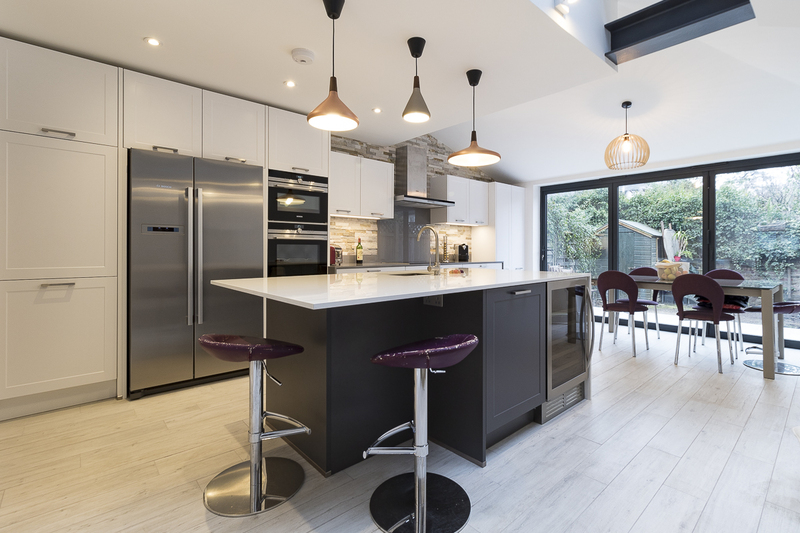 Whilst white tones are still the overwhelming favourite shade in terms of Kitchen cabinetry, strong, bold and vibrant colours are rapidly making their way. Light and dark, warm and cold, smooth and textured…we love contrasts! Opposites attract, relate to each other and arouse emotions. Paring up contrasting tones are key to visual perception, it creates excitement and brings a room to life. Vibrant colour schemes in the Kitchen are strongly gaining momentum, especially in a combination of different shades, or materials. For instance, grey and blue; dark and wood; wood and concrete; dark grey and light grey. In fact, grey is such a versatile colour and there is such a wide range of attractive shades available it is almost impossible to choose from. Traditional Kitchens have that distinctive formal and elegant characteristic. In a traditional Kitchen, the main element is the actual celebration of food, where the actual room parades the joy of cooking and cooking utensils, and free-standing appliances are displayed with pride. You will see shiny copper pans hanging from a rail, neatly arranged piles of china and organised glassware put on show. Wicker baskets, vegetables and even herbs are on flaunt harmoniously. Traditional Kitchens are warm, well structured and full of personality. To achieve this timeless look, you should mix up materials nature inspired elements, like stone and wood. When it comes to sink, the emphasis is undoubtedly on its function. Like many aspects of your Kitchen, a sink is a very personal subject. However, we have experienced a great demand for big sinks. Generous, high-performance models with a single bowl to contain the inevitable splish-splashes while simultaneously accommodating large pots, pans and trays seems to be the main requirement in the hand washing sector. 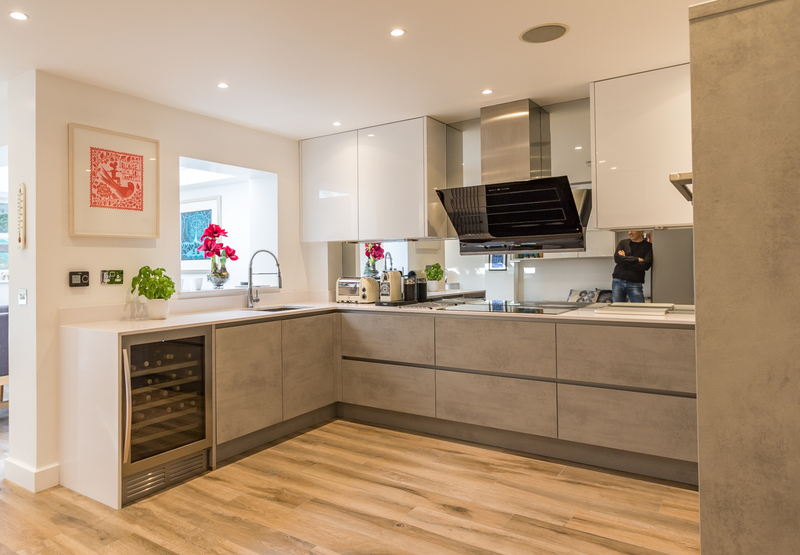 There are different models, shapes and materials to suit all Kitchens, from ultra-modern to traditional styles and interesting features like over and undermounted. We dare you not to be stirred (and even a little bit astounded) by all these trendy Kitchen ideas, original concepts and innovative technology available today. So, stop delaying that long wanted project and let us make your dream Kitchen come to life! To read about Kitchen Trends For 2018 – Part One, click here.